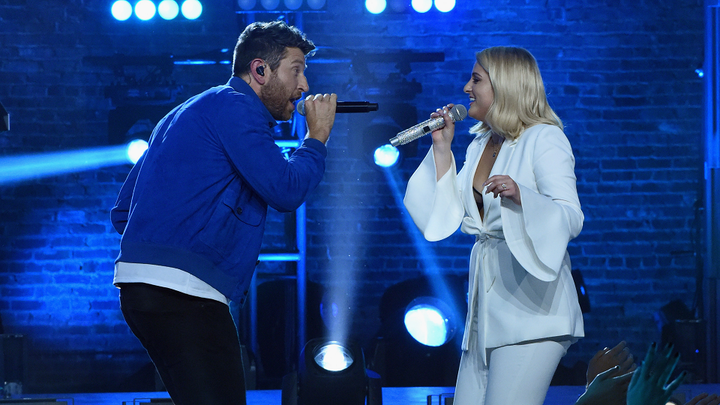 NASHVILLE – August 7, 2018 – CMT closes out its summer of electrifying music with the announcement of an all-new “Crossroads” mashup featuring multi-platinum, Grammy Award-winning pop superstar Meghan Trainor and platinum selling singer/songwriter Brett Eldredge premiering Monday, September 3 at 10 PM ET/PT. The news comes on the heels of impressive ratings growth for CMT which is on track to have its highest rated year since 2014. In F3Q’18, CMT was one of just 10 channels in the Top 50 to show YOY growth in P18-49. CMT has notched 6 consecutive quarters of YOY growth among P18-49, which is the longest active streak in all of television. Grammy-Award winning singer, songwriter, and multi-instrumentalist Meghan Trainor emerged with her 2014 breakout single “All About That Bass” and disrupted contemporary music with nostalgic pop beats and powerhouse vocals that delivered a worldwide anthem for female empowerment. Trainor cemented her rising status as one of the most prominent artists in popular music by charting seven multi-platinum singles, releasing two platinum albums, selling out three headline tours, writing multi-platinum hits for top pop and country artists, and receiving countless industry awards and nominations worldwide. She is one of only five female artists to receive a diamond certification for her hit single “All About That Bass” which shares the RIAA Gold & Platinum Awards top honor with only 15 other singles in history. After wrapping up her first season as a panelist on FOX’s hit series THE FOUR: Battle for Stardom, Trainor released her first single “No Excuses” from her highly-anticipated third-studio album, Treat Myself. She followed that up with the irresistible summer smash “Let You Be Right” and returned to television on the second season of THE FOUR. “CMT Crossroads” debuted January 13, 2002 with Elvis Costello and Lucinda Williams and since has showcased dream musical partnerships including Kid Rock and Hank Williams, Jr.; Ray Charles and Travis Tritt; Dave Matthews and Emmylou Harris; Bon Jovi and Sugarland; Kelly Clarkson and Reba McEntire; Def Leppard and Taylor Swift; Sting and Vince Gill; John Mayer and Keith Urban; Steven Tyler and Carrie Underwood; Stevie Nicks and Lady Antebellum; Katy Perry and Kacey Musgraves; and Backstreet Boys and Florida Georgia Line to name a few. “CMT Crossroads” is produced by CMT’s Margaret Comeaux and Switched On Entertainment’s John Hamlin.